Puntarelle is best known in Rome. Even there this delicious vegetable is often mistaken for a weed. A member of the chicory family, puntarelle has a bitter undertone and its stems are tender yet crisp. Puntarelle is served frequently as a cold salad with anchovy dressing. Split and pared into strips, chilled in cold water to crisp and curl. It can also be used in a stir-fry with stems thinly sliced and tossed with chopped anchovies, garlic and olive oil. Its slightly bitter taste pairs well with foods that are rich and hearty. 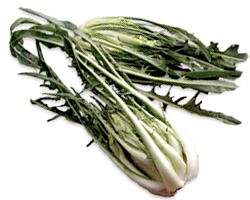 Royal Rose Puntarelle is a seasonal item generally available between November and late February. and piece of writing is truly fruitful for me, keep up posting such content. I live in Wash., DC. I was wondering if I could order Puntarelle through you for salad and soup meals for my family.